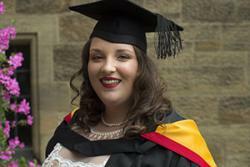 Unperturbed by the devastation of the north Wales coastline floods of 2013, a Rhyl student, whose home was affected, graduates with a first-class History degree from Bangor University this week. Former Coleg Llandrillo student, 20 year old Davina Stanley, is excited to be graduating and is ready to start the next chapter of her life. During her graduation ceremony, Davina was also awarded the Charles Mowat Memorial Prize of £100. The prize was established in 1983 in memory of the late Professor Charles Mowat, Professor of History in the University from 1958 to 1970. The prize is awarded to the most meritorious student graduating with Honours in History at the School of History, Welsh History and Archaeology. About her achievement, Davina said: “I’m overwhelmed. I put everything into my studies and to see that effort finally pay off means everything to me. It inspires me to retain that same motivation and dedication in all my future endeavours. “I’ve been taught to try my best and to be the best I can be. I set myself clear goals and coming to university was part of achieving them. Before my mum became disabled, and my dad became her full time carer, they both worked hard and achieved so much. Circumstances took all that away from them and now they just have me. I’ve been dedicated and determined for a lifetime, and I’ll work just as hard as my parents to find my own success. I aim to bring respect and achievement to my family and to be someone they can be proud of. Davina’s next steps are to undertake a teacher training course and hopefully in the future, to become a primary school teacher.